Edwards’ Life of David Brainerd is a rare, almost forgotten document depicting life in pre-Revolutionary America during the period when religious enthusiasm swept the colonial frontier. From 1743 to 1747 Brainerd had been a missionary to the Indians. Riding alone, thousands of miles on horseback, he kept a journal of daily events that he continued until the week before he died, at the age of twenty-nine, in Edwards’ house. Published in 1749, the Life of Brainerd became a spiritual classic in its own time. As the first popular biography to be published in America, it went through numerous editions and has been reprinted more frequently than has any other of Edwards’ works. 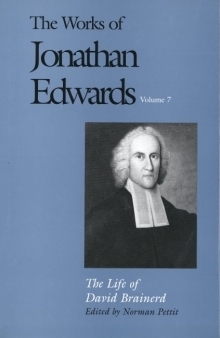 But what has not until now been known is that Edwards made drastic alterations in the original text. He shaped the narrative events to fit his own needs, presenting Brainerd as an example of a man who by example and deed opposed the rationalist, Arminian stance. Because the Yale edition is the first to print that portion of Brainerd’s manuscript that survives, set in parallel columns with Edwards’ text, these alterations can readily be discerned. This edition of The Life of David Brainerd, the first complete, fully annotated edition ever to be compiled, includes related correspondence as well as an endpaper map of Brainerd’s travels. The editor’s introduction describes the place of Brainerd’s diary in Edwards’ life and thought, and provides ample historical background.